Shoot Dang Bill you are right!!! I mean look at the Lola..she is "pretty in pink"...something tells me you did not select the color!!! Is it just me or does it look as if Bob Maskel is in his element! Man, someday I want to cruise beside him!!! Chris and I were just amazed by your beautiful works of art and your hospitality last weekend at the gathering! We had a blast taking rides, hearing your stories, sharing laughs, and enjoying delicious food and drinks. 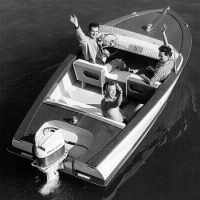 We are inspired and hope to join you as boat owners/builders some day! Many thanks for all your hard work to create and maintain such a great event. Cheers...til next year! Made me smile! And more. leakcheck wrote: Is it just me or does it look as if Bob Maskel is in his element! Man, someday I want to cruise beside him!!! Life is good, Steve. You are welcome anytime!